GPSMap Pocket PC Freeware from Craporola Software Inc.
Free moving-map GPS tracker software for U.K. Pocket PC users. Use raster map images from any source. Easily zoom and pan around large maps. Simple map calibration using British National Grid references. Receive real-time position and altitude input from NMEA compatible GPS units. Display of historic GPS position trail with customisable thresholds. Large text GPS status readout window. Storage and display of custom map position markers. Enter map point markers in OS or WGS84 lat/long coordinates. Save and load GPS trails. Import and export trails and points to Google Earth and Google Maps KML files. Ideal for Geocaching, Walking etc. Want a program that works with international maps? Try GPSGO! For additional support, news and tips visit the Craporola Forum. GPSMap-OS is a small freeware Pocket PC application that reads Global Positioning System information from NMEA-compatible receivers and plots current and historical position over user-supplied map images in British OSGB format (as used for most maps published by the Ordnance Survey in the UK). Please note that this program is not a route finder or street navigation program: it shows where you are, not where you're going. Also note that, currently, the program is only of any real use within the United Kingdom. For a program that works anywhere in the World and with international maps of any type you can use my other application, GPSGO. For a user's perspective on GPSMap-OS, read GPSMap-OS – a first-time user’s experience from Ian McLeod. Latest version is 1.61, release date 15 January 2010. Version 1.61 Microsoft embedded Visual C++ 4.0 Workspace (280KB). See notes on compiling from source. If you use and like GPSMap please feel free to show your appreciation in financial form by clicking the button below. All donations, however small, are greatly appreciated. John Thorn's MAPC2MAPC and XF2TRL programs convert map calibration and trail files between several formats. Ken Adam's Get-A-Map application can automatically download and calibrate UK mapping data ready for use in GPSMap-OS. Note that these are 3rd party applications and no responsibility is taken for their support or compatibility. Please contact the individual authors for assistance. There's no fancy installer! Simply download and unpack the relevant zip file from the link above, then copy the GPSMap.exe file to your Pocket PC. If you want the program to be available from the Start Menu then copy it to Windows\Start Menu\Programs. Several people have reported problems using this program when other GPS software is installed due to exclusive driver access to the serial port. In general only one program can access the GPS feed at a time, so ensure no other programs that use the GPS are running at the same time. For a discussion on how the TomTom GPS driver can cause all kinds of trouble like that see this Pocket GPS World article. Before getting any real use out of this program you'll need to provide some image files representing maps that in the "Transverse Mercator Projection, Airy Spheroid, OSGB (1936) Datum". These are OS maps in plain lingo. For copyright reasons none are supplied, but recently the Ordnance Survey have started allowing free download and use of small maps via their Get-a-map service. Map image files may be PNG, GIF, JPG, BMP etc. Copy the map images to any folder on your Pocket PC and load them using the File->Load Map option of GPSMap. The first time a map image is loaded you'll see a warning telling you there is no calibration information. Calibration is discussed below. It's entirely possible to use the program with no map image loaded, in which case your GPS position and trail are shown against a blank background. Map points (see later) can be entered in this mode too. Simply use the stylus to 'drag' the map around on the screen. The directional controller buttons (if present on your hardware) may also be used to pan the map. The toolbar zoom buttons and the View->Zoom menu option at the bottom of the window allow modification of the image scale. The View->Map Centre option will move the screen viewport to the centre of the map image if you get lost off the edges! Clicking with the stylus at any point on the map will plot a crosshair cursor at that position, which is used for defining map reference and calibration points. If a GPS fix is available then the range and compass bearing from your current position to the cursor is shown at the bottom of the screen. Clicking and holding the stylus at any point on the map raises a context menu from which you can perform some common tasks such as centring on the GPS position or creating a map point. If "Follow GPS" mode is on and you are receiving a GPS signal then the screen will keep jumping back to centre on your current position while you're trying to move the map, so turn that option off if you need to pan around. 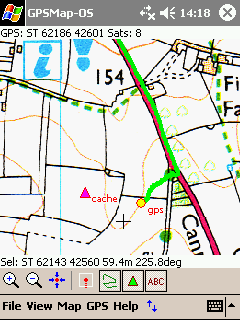 Scroll the map to show a position with a known grid reference (eg. on a grid line intersection) in the South West (usually bottom left) region of the image and select a high zoom level (for accuracy). Click on the map to place the crosshair cursor at the required reference point. Select Map->Calibrate SW from the menu and enter the OSGB grid ref for your reference point. Find and select a position with a known grid reference in the North East (usually top right) region of the image. Select Map->Calibrate NE and enter the required OSGB grid ref. (Optional) Select Map->Settings... and enter the variation of Grid North to Magnetic North in degrees. This is used to calibrate the GPS to cursor bearing display. If you're confused, this diagram showing a simplified typical calibration example for an OS map may be of some help. There is no requirement for map images to be exactly straight, "north up"; indeed arbitrary rotation is possible. The accuracy of the calculated position will vary across the entire map depending on the orthogonality of your map image. Maps may be recalibrated for any necessary "fine tuning" at any time. You can also enter/adjust calibration points by visiting the actual location of a feature on the map with your GPS receiver, clicking the selection crosshair on that point and then making use of the "Use GPS Position" button on the coordinate entry dialog to fill in the coordinates. Select GPS->Settings... and go to the 'Connection' tab. Here you can enter the COM port and Baud rate for serial connection to a NMEA compatible GPS unit (which is basically all GPS receivers that work with a PocketPC). If you have a Windows PocketPC 2003 and a Bluetooth unit, as I have, then COM port 8 is a good bet. Wired units will probably use COM1 or 2. Windows Mobile 2005 Bluetooth serial ports are usually on COM 6 or 7. The standard NMEA baud rate is 4800, leave it at this value if unsure. Select the OK button to close the settings dialog then use GPS->Connect to open the connection. If all is well your current GPS position will be shown as an OSGB grid reference in the upper status area. If using a Bluetooth receiver then, depending on your device and setup, you may need to manually connect to your GPS receiver using the Bluetooth Manager before trying to connect to it with GPSMap. Use View->Centre on GPS to move the map display to your current position. The View->Follow GPS option turns on/off automatic scrolling of the map as your GPS location changes. As you move around a coloured trail is drawn indicating your last positions. The colour, length and style of the trail display may be modified on the 'Trail' tab of the GPS->Settings... dialog. Also on this tab is a "Min Delta" setting, which controls how far you have to move before the trail is extended. Trails can be saved and loaded at any time using the options on the File menu. Loaded trails are combined into any current trail on display, allowing you to build up a route from multiple saved legs for example. Trails can be saved either in GPSMap native format (.trl) or as a Google Earth KML file, but note that only .trl files can be loaded back into the program later. The current trail may be cleared from memory using the GPS->Clear Trail menu option. The GPS->Track menu option is used to turn recording of the trail on and off. This allows you to move around without adding to the current trail, for example when wishing to follow an existing trail. A large textual readout of the current GPS data (OS National Grid Reference, altitude, course and speed) is available using the View->GPS Info menu option. The course and speed values displayed are as reported by your GPS receiver rather than being calculated by the program, so it is possible some receivers that do not report the required NMEA data will only display a reduced set of information. Each map can have any number of displayable reference points associated with it, which can be used to mark a known position or store a visited GPS location. Map points are saved persistently alongside the map image file. From the Map Points dialog. Select Map->Edit Points... and click the "New..." button. All entry fields are blank and a name, position and symbol selection must be made manually. From the GPS->Store Position... menu option. This adds a new point with at the current GPS position and raises the Edit Points dialog for optional modification of the name/symbol etc. From the map context menu, which allows creation of a new map point at the current cursor position or at the position the stylus was clicked to invoke the menu. Existing map points may be edited or deleted from the Map Points dialog, which also has a handy "Show" button to centre the map display over the selected point in the list. Map point positions may be entered as OS grid references, or as WGS84 latitude/longitude coordinates (which is ideal for entering the locations of geocaches for instance). Map points can be imported and exported from/to Google Earth KML placemarks using the "Export..." and "Import..." buttons on the map points dialog. As mentioned above, your GPS trails can also be exported to KML format and loaded into Google Earth. The source zip file contains a complete workspace and projects for building the GPSMap-OS, GPSGO and CoordConv programs for PocketPC using Microsoft eMbedded Visual C++ 4 or Visual Studio Pro 2005 and above. In order to build the application fully you will need to obtain the separately distributed free version of the CMarkup XML parser library from http://www.firstobject.com/dn_markup.htm and insert the Markup.h and Markup.cpp files manually into the project. If you try and like this program (or not) please let me know and encourage continued development and improvement. Feature requests and bug reports are always welcome. GPSMap-OS is released under the terms of the GNU General Public License, version 3. This site and its content is copyright (c) 2005-2010 Dr. Matt Voysey, Craporola Software Inc.